Spoiler alert – I really dislike films with improvised dialogue, in fact I downright hate them. Yes I know there is the odd gem like Spinal Tap but for the most part they just make cringe worthy viewing. American Hustle should have been a thing of genius. It has an excellent cast, great story (plot details are in the title), brilliant production design and attention to detail. So for this reviewer it is just a massive shame that the prior mentioned ingredients are ruined scene after scene by the cast's improvised dialogue. Instead of sharply observed insightful gripping scenes, we have the cast repeating the same thing three times just to make the point. When they don't know what to say, hell, they just say the first thing that comes into their heads. The worst part is that I don't know who to blame – the cast for arrogantly thinking they are script writers, the director for not taking a tougher stand or the producers for just allowing the thing to evolve in the way it did. 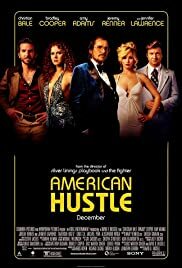 American Hustle will win Oscars, not because it deserves to, simply because it has that awful thing called the big momentum. For me, it is simply the emperor's new clothes circa 1975.